Florentine Candelabra, from Late 1800s Italy. 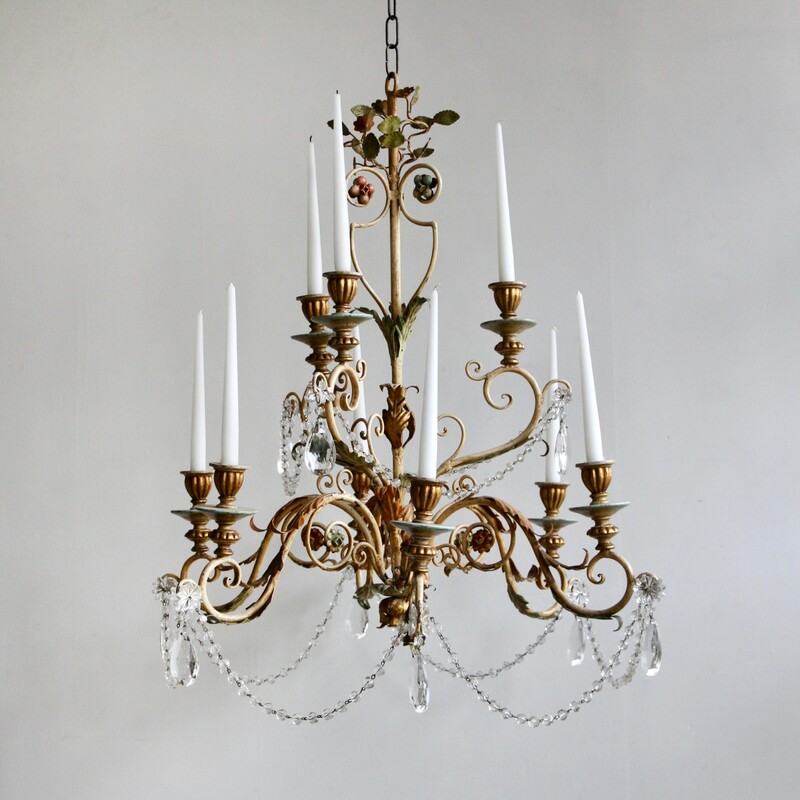 This Florentine candelabra originates from late 1800s Italy, the chandelier is in great condition with it’s original painted frame and gilt-wood candle holders. Dressed in the original lead crystal pear droppers with glass faceted beaded swags its a delicate piece. Shown with long tapered candles, the frame holds nine, three upper and six lower. Supplied with chain, ceiling hook and a ceiling rose. This chandelier has been restored here, in Stockport, near Manchester by our small team of professionals and are now ready to be installed. We recommend that the chandelier is installed into a joist or a supporting noggin. To clean the chandelier dust the frame regularly with a soft cloth. The crystal droppers can then be wiped with a glass cleaner wipe or a cloth that has been sprayed with glass cleaner. A final wipe with a paper towel will give a polished finish. This Florentine candelabra could be electrified at an additional cost. Please enquire for more information.